I love the balance running provides me in my life. It keeps me focused and helps me clear my head. I enjoy the challenge of training and racing. It’s always rewarding to run a PR! Each marathon I have run has been special to me! Personally, my best marathon memory was my first marathon in 2006 (Detroit Free Press Marathon). 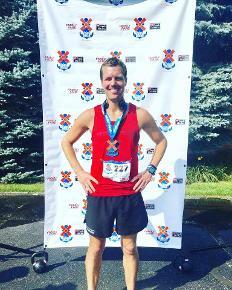 I ran a sub 3:30 marathon, and I will never forget how I felt! I really enjoy pacing! It is very rewarding to motivate other runners, help them reach their personal goals and give advice and leadership. Pacers are mentors and coaches for other marathoners; and I am excited to be part of the experience. 2013 Glass City Marathon – I ran with a wonderful group of runners and I paced fairly consistently that day. The group was quite large, talkative, motivated, and we had cold, rainy weather. Even though the conditions were not ideal, I couldn’t have done it without some awesome pacers! You will receive excellent coaching, advice, and leadership by running with my group. I will give motivation, energy, and provide a fun group to run with. I will pace consistently for optimal marathon performance to help you reach your goals. Working in the fitness industry, I have to be motivating, challenging, & intense. My advice for all marathoners: trust your training, relax, and enjoy race day and the marathon experience. You will be pleasantly surprised. My wife and I live in Holland, Michigan. We are both kindergarten teachers.